Let me start out by saying that my tastes are very catholic (not to be confused with the religion that I abandoned eons ago. Big difference). I love all kinds of exotic food, and it’s hard for me to turn down a Prohibition Era cocktail or a good glass of Champagne. But, like my Mom, I’m a Southern girl at heart. I positively swoon over things like The Allman Brothers Band, Spanish moss dripping from big oaks, hot buttermilk biscuits, and a simmering pot of navy beans with a ham hock. And then, there’s always a damned fine glass of bourbon to look forward to. 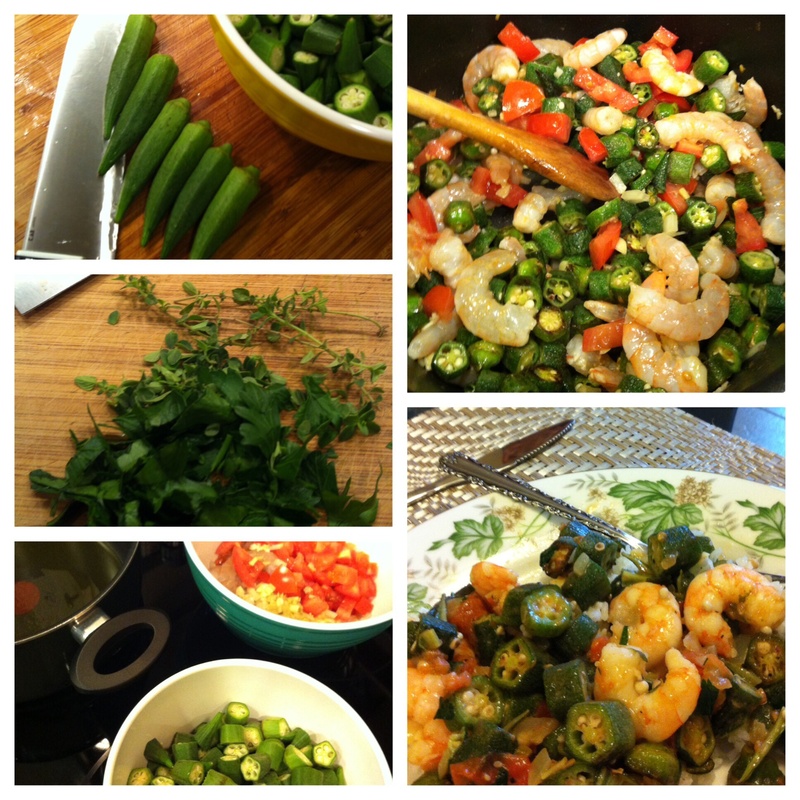 My Mom never cooked okra, and I hadn’t either until I saw this recipe by BJ Dennis in my latest Garden & Gun Magazine. It wasn’t hard, or even time-consuming. A little bit of prep work (I noticed the okra were “prickly” so I scrubbed each and every one against the grain. Probably get laughed at by a “real” southern cook for that!) The whole thing comes together in about 12 minutes. Easy and delicious, Mom would have loved this…I hope you do, too. I have never been able to sit on a cushion and stare at the wall. I’ve tried, trust me…over and over again. I thought it “would be good for me.” Finally a teacher told me that there are many ways to meditate, many ways to practice mindfulness. Perhaps I would do better with a moving meditation? I haven’t sat still since! Last Tuesday I was at my friend Gina’s house for lunch and a confab, and while we talked, she made Gumbo. I have never made it…ranking it up among the things I deemed too difficult; like an elegant Crown Roast or a Buche Noelle. 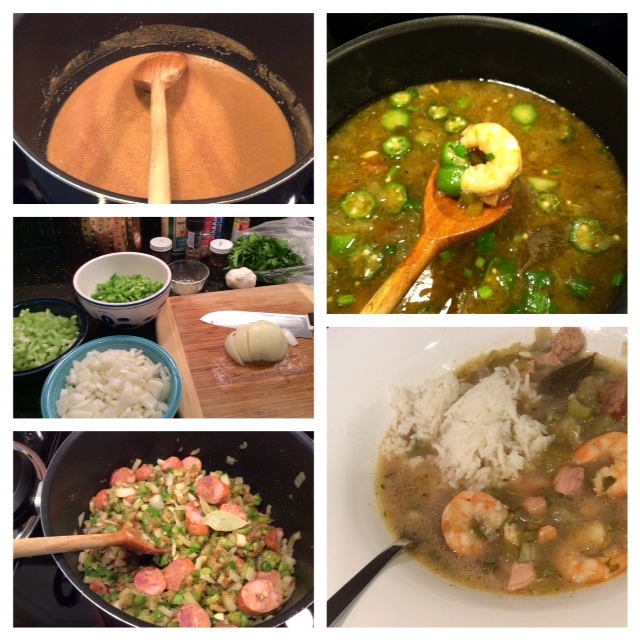 I have lived this long without needing to cook any of them…and then I tasted her gumbo. Holy Gina Marie Lucia! I had been watching closely, asking questions and taking notes as she cooked. And as she did, we sipped wine and caught up on each other’s lives (yes, we were day-drinking…but it was wine. Doesn’t count) and when she finally put a garnished bowl in front of me – I was hooked on gumbo. This stuff is the ‘Crack’ of the soup world! I realize that I am rewarded every time I take steps to overcome a fear. And I’m reminded that cooking is a lesson in staying present, a form of mindfulness meditation. From organizing the shopping list; remaining patient through all of the cutting, chopping, and measuring; and slowly, slowly browning the roux. The payoff is not just in experiencing a delicious meal, but feeling both love and gratitude as I sit at the table and eat. Gratitude that I have such healthy, delicious food to eat. Love for the partner I prepared it for (who adores gumbo), and for the dear friend who shared her expertise with me. I can’t wait to make another batch! Want the recipe? Let me know in the comments!